Have you ever just wanted to make something totally different than your normal style? I have all these cool Delicata ink pads and wanted to see what they look like on black. Must admit, I am kinda liking it! 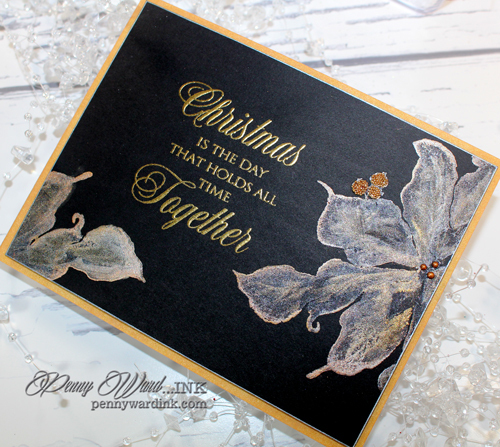 The poinsettias are stamped with a Misti and Delicata Golden Glitz, Celestial Copper and White Shimmer. Glass beads for the "berries" and Crystal Drops for flower centers. This card is just shimmery goodness!!! 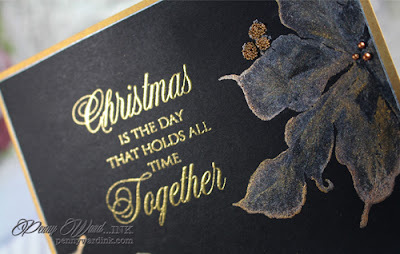 Your card is absolutely gorgeous you have so much talent and we are lucky that you share it with us bloggers thank you! This is really beautiful and elegant. I love how you showcased the sentiment with the large cling stamp, Penny! The gold really is gorgeous against the black! 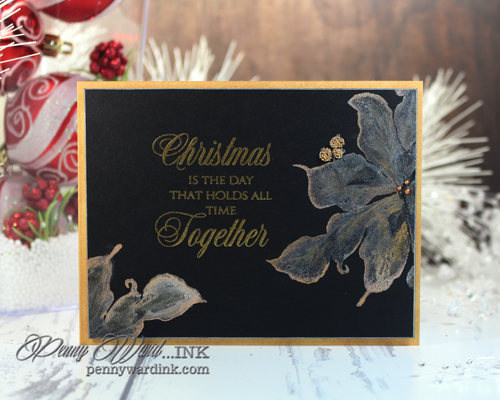 So glad that you join the fun over Simon Says Stamp Wednesday” Anything Goes” Challenge! This is stunning, Penny. One of my favorites yet entered in this challenge. You have such a talent. I'm just blown away with your amazing talents, and can't thank you enough for sharing with us. It's such a blessing to have you play along, and I sincerely hope that you will join us again soon. www.karen-mycuprunnethover.blogspot.com - I'd love to have you stop by to say hello. This is stunning!! Very elegant and unique. You have a magic touch; love everything you do. 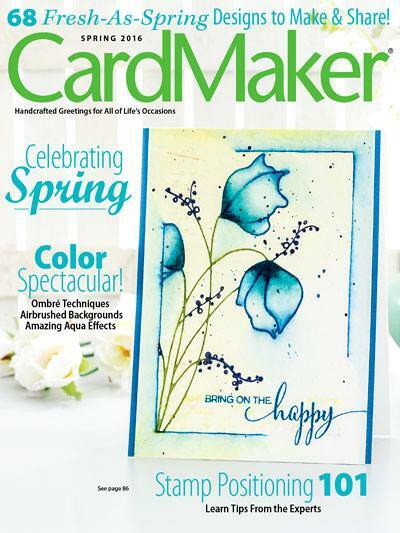 congrats on the FB post by Penny Black! !